Forest Field Park has been a site for exciting improvements over the past year, including a paved walking path, gravel trails and a new restroom building. Now we are replacing the playground! 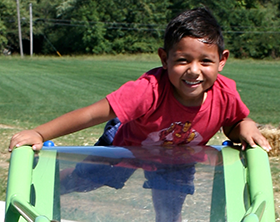 The new playground will include an all accessible surface, new main play elements and a nature play aspect. Community feedback is being sought regarding the design. Thank you for taking the time to help shape your community’s BIG backyard!